It’s billed as Australia’s most luxurious escape, owned by one of the world’s most upmarket airlines, so you’d expect Wolgan Valley to offer a flawless experience. But does it deliver? Quentin Long finds out. The Emirates One&Only Wolgan Valley development was the first resort created by the Emirates group outside the UAE. Intriguingly, its announcement was greeted by Australians with more shock than drooling anticipation – or pride in being selected for such a prestigious development. The Wolgan Valley sits between the Wollemi and Gardens of Stone National Parks, on the fringe of the Blue Mountains World Heritage Site. All sounds fantastic and befitting an über-luxury resort. Until the chattering classes in Sydney asked, “And exactly where is that?” Turns out, it’s just passed Lithgow. The incredulity was palpable. Why would you build anything luxurious near Lithgow? The town’s reputation for being one of the least picturesque or inspiring places to visit in Australia had obviously not been relayed to Dubai. True to Australian form, it has taken a foreign company to appreciate what we have taken for granted. This is a stunning part of the world and we are lucky to have it. Even luckier to have Emirates prepared to spend $125 million on building a 40-villa resort. Even more true to Australian form, the resort was almost never completed, due to the bureaucratic development and conservation laws of three tiers of government. It’s rumoured that Emirates has said if it knew what it was in for from the Australian bureaucrats, it would probably never have bothered with Wolgan. “There is something wrong when we have to find the hoops, hold them up and then jump through them,” an exasperated Emirates source was quoted as saying in trade media a year out from the opening. As Emirates discovered, not only is our landscape and environment unique, so are the meddling ways of local, state and federal governments. Australians should be very thankful for the perseverance of Emirates. The resort is one of the top four in the country. The stunned and insulted wife – you’ll remember her as The World’s Most Beautiful Bride (TWMBB, now TWMBW, for Wife) from a few issues back – keeps her conniption to herself while we wait five minutes for the arrival of our transfer. It’s a short 4WD drive from the car park to the stunning homestead, where staff are the welcoming antithesis of the security guard. Wolgan Valley is 25km long and it is divided in the middle by Donkey Mountain, which sits like a pedestrian island in a street, creating a smaller, private valley on the southern side. 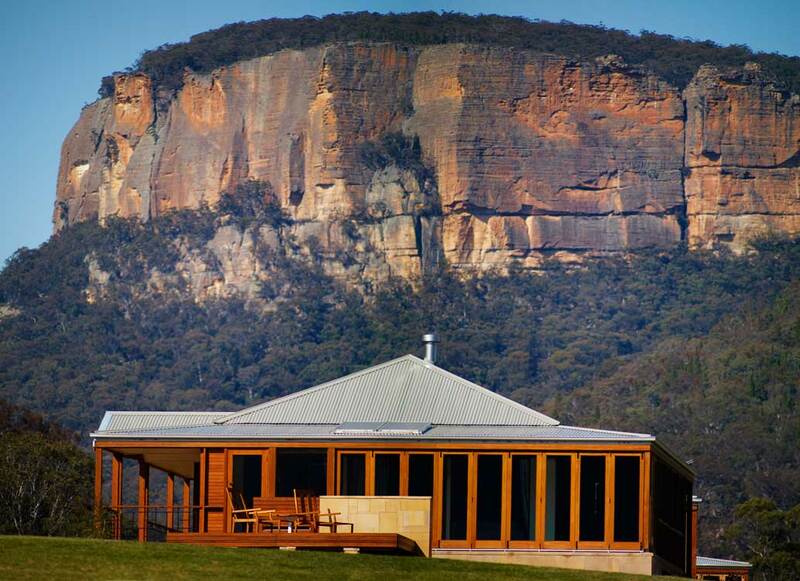 The resort nestles in this private valley, surrounded by sheer, grand sandstone cliffs. Resort buildings back up against the sandstone wall at the northern end of the valley. The views are magnificent and every structure makes the most of them. The property is former pastoral land and reminiscent of the African savannah, but with kangaroos. The main building is a two-storey communal homestead. Its upper floor has a high, vaulted timber ceiling with sandstone walls separating two formal dining rooms from the bar. It’s an airy structure, where high-backed dining chairs and couches give a relaxed, regal and elegant feeling to dinner and breakfast sittings. The lower floor houses a casual café for a bistro-style lunch, as well as an all-day dining room, where you can go any time between 6am and 6pm to order from an à la carte menu. But the highlight of the resort is its gorgeous villas. Each villa is a quintessential Australian homestead – just with one bedroom. There are front and back verandahs; the back verandah has heart-stopping views up the valley and two rocking chairs, just no wood for whittling, nor a shotgun. Inside, the villa is cosy and indulgent. The front door opens to a lounge room which has two walls of floor-to-ceiling windows, one welcoming in those awesome valley views; the other looking out across a fab indoor pool to a native garden. The pool is enclosed by bi-fold windows, which push back to make the pool open-air if the weather warms up – which it will do, particularly in February. It’s a shame, but guests can’t open the windows themselves; you have to ask the staff to do it for you. The lounge is separated from the bedroom by a wall and chimney flue constructed from the same golden sandstone used in the main homestead. The double-fronted fireplace opens into both rooms, and the gas fire provides a romantic (and much-needed) heat source during our late-winter stay. The bathroom and separate toilet are situated at the far end of the suite. The tiled floors aren’t heated, and the hardwood panelling is not as chic as in other rooms. The skylight above the shower fills the space with sunlight and the house-branded Babor products are excellent. The bathtub is not the romantic freestanding affair of the three other top luxury lodges in Australia (qualia on Hamilton Island, Saffire Freycinet and Southern Ocean Lodge, Kangaroo Island), but Wolgan has something over them all – the cosy and quaint bedroom is dominated by an enormous custom-built four-poster bed. “I never say thought I’d say this, but this bed is better than the one at qualia,” says TWMBW on our second night. She should know. Over our 48-hour stay here, she leaves the bed for a total of five meals, two showers, one tour and one spa treatment. And it’s a close call when it comes time for her spa treatment. Will she escape the clutches of the soft, indulgent bed to make her appointment, or just collapse back into the cloud-like mattress? It turns out that TWMBW knows her beds. Since opening, 30 mattresses have been bought by guests at $3000 a piece. It’s a bedroom combination unrivalled in Australia. As we find out, Wolgan turns out to be the ideal romantic, relax-and-rejuvenate escape for Sydneysiders. The entire resort has been designed to occupy just two per cent of the entire 4000 acres Emirates lease and own in the area. 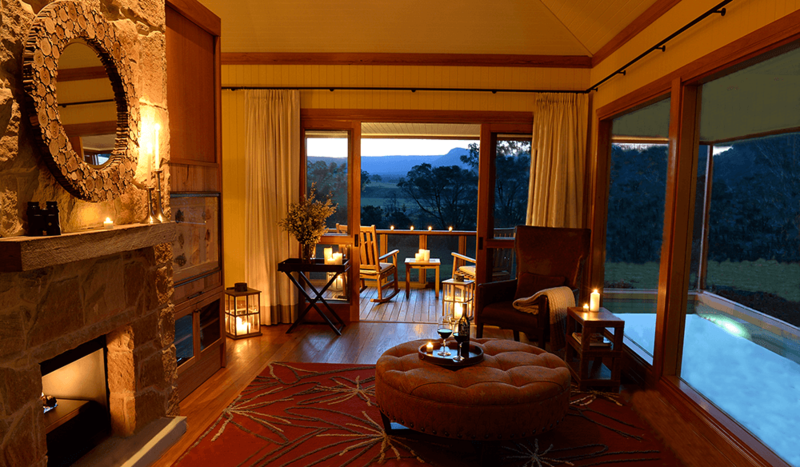 In its literature, Emirates describes Wolgan Valley as a conservation-based luxury resort. This is not a trite marketing spin but a very serious part of the resort’s DNA. For example, not one tree was felled to build the resort. It was the first resort in the world to be given a carbon-neutral certification. More than 175,000 trees have been planted in the rejuvenation of the land and wilderness. Emirates has also put real effort into restricting feral animals, and instigating a breeding program for endangered species. Notably, the environmental ideology also extends to the food – most of the produce and wine is sourced within a 160km radius. There are downsides to limiting the resort’s carbon footprint: the villas are close together and therefore don’t feel as private as perhaps one wants from a break like this. TWMBW is surprisingly unperturbed, and possibly gives the other villa guests some Full Monty moments as she cocoons herself in the bedroom, but I find it incongruous for a high-end resort. Privacy between villas should be a given. On the upside, the setting is incredible. You can explore the wilderness on various included activities. 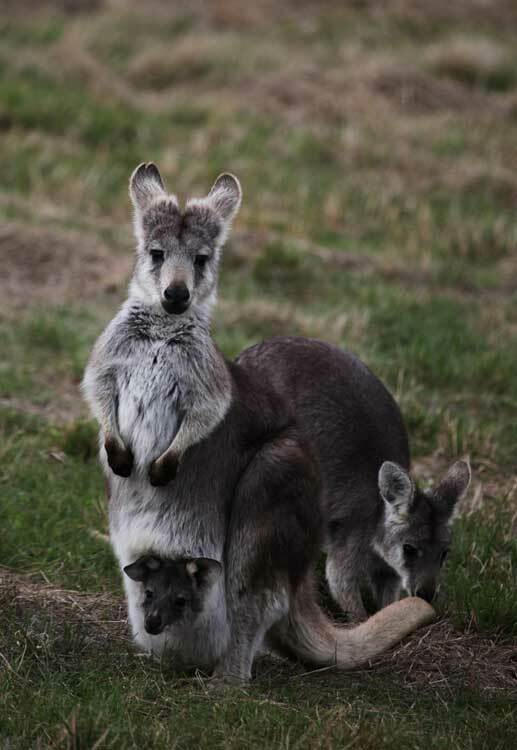 A Wildlife Sundowner tour covers a great deal of the property to the beat of bounding of kangaroos, wallabies and wallaroos (known as euros elsewhere). A gentle horse ride is a relaxed way to experience the property. (The horses are housed in luxury befitting thoroughbreds.) Other activities, such as clay target shooting and trout fishing are available, too, but no-one told me you had to book these ahead of your stay so I’m disappointed I miss out. Thankfully there’s no pressure to get out and do things just because you can, unlike at Longitude 131°, where the program is relentless and the alternatives are not great. The activities reflect the leisurely pace of Wolgan Valley resort – just long enough to entertain you but not so long they exhaust you. You feel like you’ve experienced something without it interfering with the serious downtime you need if you’re taking a break like this. Our guided tour is short on narrative, though when prompted, our guide offers interesting insights about the flora. And while it’s honourable that Emirates spent $2 million immaculately restoring an original 1832 homestead to provide a museum-like attraction, you wonder why… Domestic travellers have seen it all before – just not to this impressively high standard or with such an awesome vegie patch out front. The thing that’s most out of step with the rest of the experience is the food. It’s good most of the time and occasionally great. But at this level, it should be consistently excellent. Our lamb shank pie is dry and lacks depth of flavour; a wild mushroom risotto is indelicate and messy. Every dish misses seasoning; we are forever reaching for the salt and pepper. The TWMBW’s decision to leave the bed for the spa is worth it. 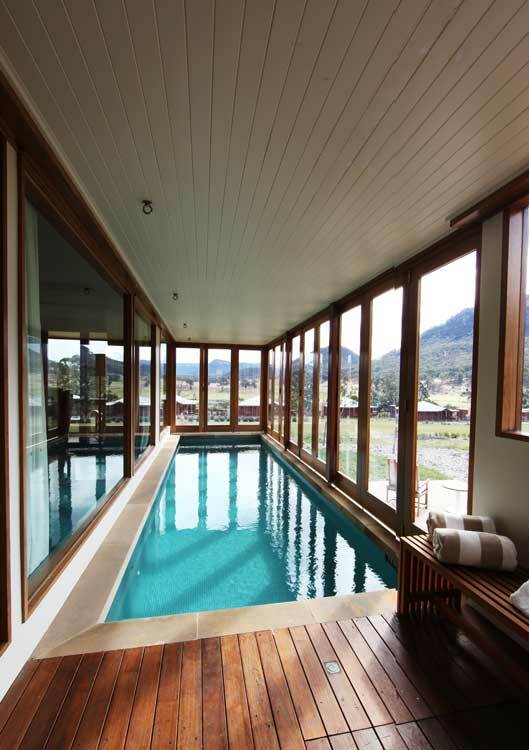 Wolgan’s Timeless Spa is beautifully designed and the therapists are top-shelf. It’s not surprising US Conde Naste Traveler has rated the spa Australia’s best. If she was relaxed before she went, TWMBW returns to the room a puddle, effusive in her praise. She says it’s the best spa experience she’s ever had in Australia. 2600 Wolgan Rd, Wolgan Valley, NSW. We took up the special winter offer of $1375 per night for two (with a two-night minimum). Rack rate is $1950 per night, inclusive of meals and local wines. The latest Spring Package is $1470 (minimum two-night stay with some additions). Take your chopper. Or drive 175km from Sydney in your worst car – the last 25km are on a pot-holed axle-breaking dirt road, so bugger the sneers of the security guard. It’s almost exactly two hours from the M7 intersection on the M4. Our credit card was declined on the Emirates website until we were contacted by our bank’s call centre clarifying we were in fact trying to purchase something from Emirates. According to the call centre, the Emirates website is notorious for fraud and they refuse transactions as a matter of course. 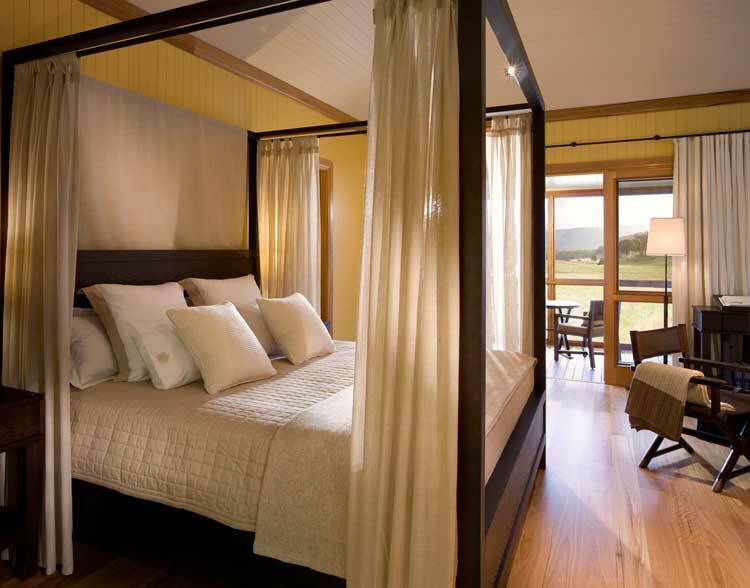 “There are two aspects of this resort that are the very best in Australia – the spa and the bed. It is one of the best exclusive elite resorts in Australia.